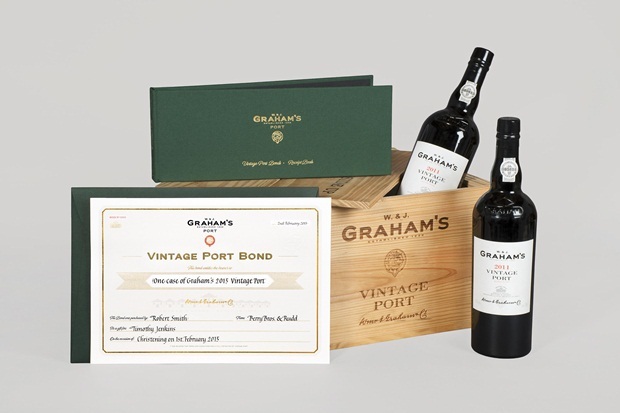 Grahams has launched a bond to buy vintage port in the year it was harvested. You can buy a port bond which can be redeemed 18 months later. In the meantime you will received a personalised certificate to mark the occasion until the vintage port is made. If the Vintage is not declared the bond holder will receive two cases of Quinta dos Malvedos. In the unlikely event that no Vintage port is made at all during the the year due to extraordinary weather then a full refund or an alternative will be given. It has long been a tradition for special occasions to be marked by the laying down of Vintage Port from the year of the event. Problematically, due to the fact that a ÒVintage yearÓ is normally only declared in the second year after the harvest, the recipient of the gift often has to remain empty handed until sometime after the celebration. In order to overcome this problem, GrahamÕs are now the first Port company to provide a Vintage Port bond which is available for purchase in the year of harvest. Allowing the purchase of Vintage Port while the wine is still on the vine guarantees that a certain quantity of the wine produced will be reserved for the holder of the bond. 1. This bond entitles the holder to 1 x Case (6 x 75cl bottles) of GrahamÕs Vintage Port in a ÔDeclared YearÕ or 2 x Cases (6 x 75cl bottles) of GrahamÕs Quinta dos Malvedos Single Quinta Vintage Port in a ÔNon DeclaredÕ Year (For full definition of Vintage Ports see ÔVintage Port DefinitionÕ). 2. If, in the very unlikely event that no GrahamÕs Vintage Port is produced in the year for which you have purchased your bond, then the recipient of the bond will be offered a case* of GrahamÕs Vintage Port from an alternative year. 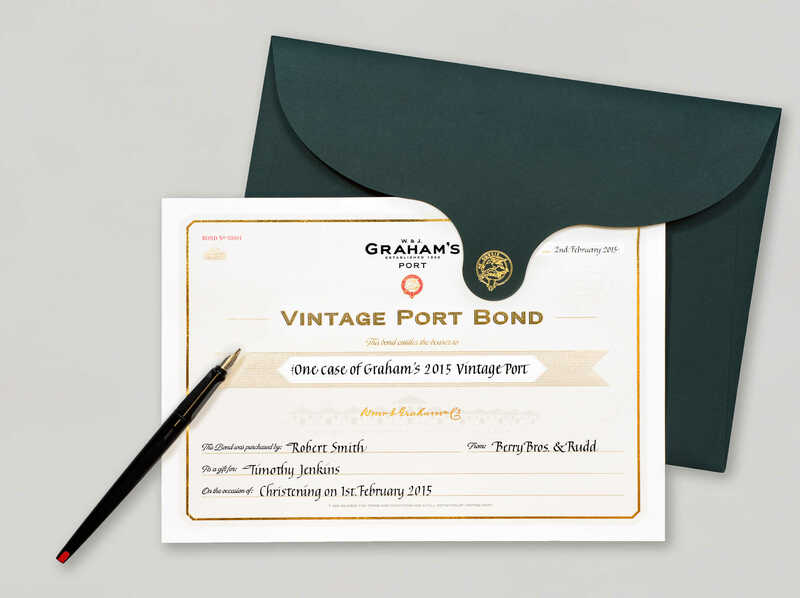 If the recipient of the bond does not wish to receive a case of GrahamÕs Vintage Port from an alternative year then purchase price of the bond will be refunded in full to the recipient of the bond, or their legal guardian if they are under 18 years of age. 3. This bond may be purchased by any adult aged 18 years and over. However, if the recipient of this bond is a minor they are not legally allowed to consume the Port against which this bond is redeemed until they are aged 18 years of age or over. 4. This Bond may only be exchanged for the case of GrahamÕs Vintage Port* for which it was purchased, and cannot be exchanged for the monetary value of the purchase, or any other product. No negotiation may be entered into with the retailer, John E Fells & Sons Ltd (The UK Distributor of GrahamÕs), or Symington Family Estates (Owner and producer of GrahamÕs Ports). 5. The purchase price of this bond includes UK Duty, VAT and delivery to any address in the UK. Deliveries to addresses outside of the UK may incur a surcharge. At the time when the Port is ready for collection, the purchaser of the bond will be contacted (using the details submitted at the time of purchase) to arrange delivery. The Vintage Port that you have acquired with this bond was (or will be) harvested in the autumn of that year. Thereafter it will spend approximately 18 months maturing in seasoned oak barrels before it is carefully selected from only the very best barrels and bottled. 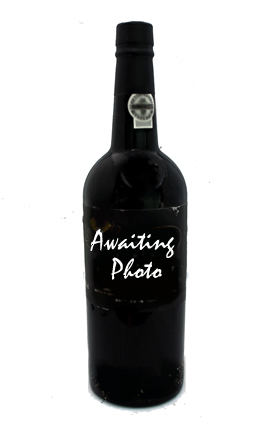 Once bottled, it will be available for shipment to the UK approximately 2 years after the harvest. General Vintages are declared approximately three or four times each decade, when there are prefect growing conditions across the Douro Valley and in the GrahamÕs vineyards. If a ÔGeneral VintageÕ is declared at the time when your Port is bottled, your bond will be exchanged for 1 x wooden case of 6 x 75cl bottles of GrahamÕs Vintage Port. In years when a ÔGeneral VintageÕ is not declared, the finest wines from the finest properties are almost always declared as ÔSingle QuintaÕ or ÔSingle EstateÕ Vintage Ports. If this type of Vintage is declared your bond will be exchanged for 2 x wooden cases (containing 6 x 75cl bottles) of GrahamÕs Quinta dos Malvedos Single Quinta Vintage Port. Please note that only a relatively small amount of Vintage Port is produced in any given year, and that the total production is unlikely to increase significantly from year to year. The Vintage Port you have purchased is therefore valuable and may increase in value, providing it is stored under the right conditions.